Here it is! 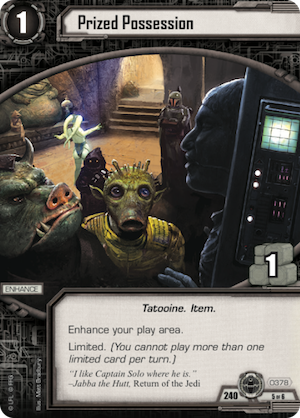 The upcoming Scum and Villainy set with Dr. Evazan and Ponda Baba. Check it out and let us know what you think! Great set, my only question is why is Ponda Baba so nuts good? I'm enjoying the dynamic duo stuff Scum has been getting. 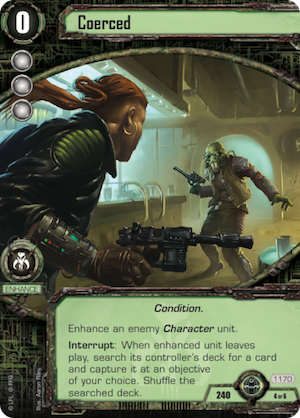 Evazan + Ponda is going to be just as scary as Zuckuss + 4-LOM. 3x 2 force cards, 1x 3 force card and resource. 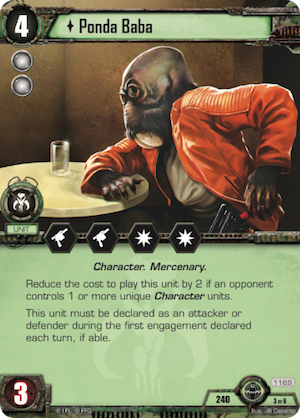 Ponda Baba is the next low cost OP Scum unit after Spider and Z-95. Now Scums have an answer to Qu Rahn and Yoda. Just blank them for free! OMG... I already don't have room for all the good scum pods in one deck. Here is another auto include. You're too kind, good sir. I really wasn't expecting another 9-pip set with a resource. 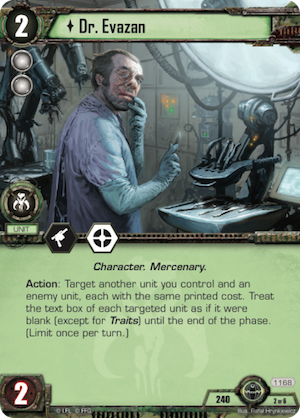 And every single card is incredibly good, though the Doc' may be slightly inconsistent. 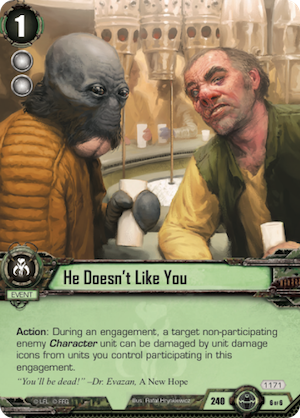 Are Scum the new Jedi? Does this cycle put Scum to the top of the hill for DS...it's looking good right now. That objective is super awesome and I can't wait to see what shenanigans I can pull off with it. Though I don't think it works with Dengar's objective quite like you guys said in the video - if you prevent any of the damage, the cost hasn't been paid and you don't get the effect (but protect should still work, if scum had anything to protect objectives with). To be fair, just about every spoiled card/set from the Opp cycle has looked pretty dang amazing. Only Kallus' is the exception, but more because it's too combo oriented and seems like it's supposed to be played in troopers, who aren't exactly in the best spot. But yeah, Scum is turning out to be particularly strong. The phrase you're looking for is "over correction ". Just ONE captured triggered twice will be game winning. Good point! I got a little Scum happy. Can you blame me!? I was a huge fan of Dr. Evizan in the Decipher card game. It warms my heart that he is so good here too. Jeezus I think it is! Dr Evazan has nothing on a 2 cost Ponda Baba. Those stats. Wow. Only drawback is you don't want him turn 1 and he is so much better with Evazan out because then you can target him to ignore the drawback. Does anyone remember that time when scum couldn't damage objectives? They're a pretty distant memory. 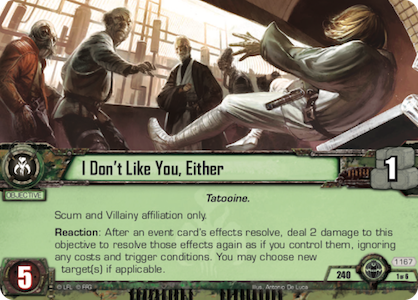 I also remember when Scum didn't have resources in good sets, but it's so hard to be sad about those days with all these pretty green cards floating around. Can't wait for the "How to beat Scum?" threads. For a long time lack of resources, inefficient sets, low edge and lack of blast were the big problems with Scum. They could fortress with guns and tactics but the LS win condition is so easy and Scum didn't really have force hounds so they had to fortress for more turns than they could actually handle. And even if you could get this to work, in a tournament setting it was too slow. But for a long time now Scum hasn't had those problems at all and the number of hyper efficient sets has gone way up.